The when campaign to do what, you ask? 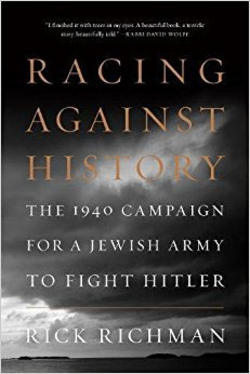 You're excused if the subtitle does not ring a bell, for Richman, a lawyer, talented author, and formidable researcher, has resurrected the failed and now-obscure effort to mobilize American Jews to create a fighting force against Nazi Germany. On the surface, he relates a story about three grandees of Zionism – Chaim Weizmann, Zeev Jabotinsky, and David Ben-Gurion – who traveled to the United States in the single year 1940 to arouse the world's largest, richest, and freest Jewish population to concern itself with the horrors underway in Europe and to respond by supporting a Jewish army. Each of the three met with frustration because of a prevailing American mood of isolationism and a Jewish leadership fearful of getting out too far in front of general opinion. But Richman's real story is that of a heroic and visionary Jabotinsky, 59, then at the peak of his rhetorical and organization powers, versus not only the other two Zionist leaders, both too timid, but also against what a Jabotinsky assistant, Benjamin Akzin, more broadly called the "Society of Trembling Jews." Jabotinsky had already organized the Jewish Legion as part of British forces in World War I; now he foresaw something of the terrible fate awaiting European Jewry, an insight even his most distinguished contemporaries (Louis Brandeis, Abraham Cahan, David de Sola Pool, Stephen Wise) were unable to fathom and furious at him for even discussing. Jabotinsky could have organized the noble, important, and necessary reality of a Jewish army drawn from the ranks of refugees, residents in Palestine, and others; but he suddenly died in August 1940 while visiting a Jewish self-defense camp in Upstate New York. With him died that army. Richman's tale reverberates with implications for today, when again a "trembling" Jewish establishment prefers to remain within the polite consensus than to have the imagination and drive to take on pending disasters. Be polite, they say, be patient, and things will work out. That approach failed in 1940; will it work today?